One of my summer projects is to learn more about public attitudes towards indigenous rights in British Columbia. I am also looking for current examples of the stigmas and stereotypes associated with indigenous hunting by non-native people (Figure 2, in which foraging is confused with pastoralism, for example). Conveniently, events surrounding a blockade in Tahltan territory last fall have provided me with a tremendous amount of data on this topic. Last September, Tahltan people blocked the only road into the Klappan watershed to non-native, resident hunters. 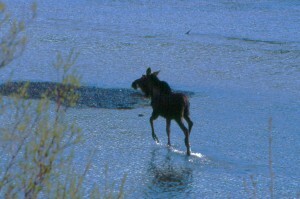 The decision to blockade stemmed from a fear that the moose populations were declining too rapidly because of over-hunting. It was also related to the fact that there is an open season on moose in the Klappan; this is one of a very few areas in British Columbia where moose hunting is not regulated by limited entry licences. Just as interesting as the public discussions on the CBC’s website are the discussions about the blockades that erupted on chat boards within the HuntingBC.ca forum. There, six different threads offered hunters – native and non-native – the chance to talk about the blockades, moose hunting and, indirectly, aboriginal hunting rights. Over 800 comments were made on these boards (eg. Figure 3). One of the boards offers a new thread around planning for the fall 2010 moose hunt. After capturing permanent copies of the articles and comments using Firefox’s Scrapbook and Fireshot add-ons, I’ve begun the process of coding the articles and comments using Atlas.ti software. A few generalities are emerging. 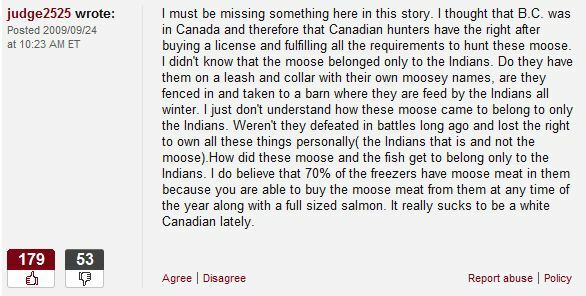 The articles themselves identify the concerns of First Nations people around the over-hunting of moose and the open season. The articles cite the need for meat for sustenance and fear of the extinction of moose as the two main reasons for protesting the open hunt. The perception of some is that the fate of the moose will mirror that of the pacific salmon. In most cases, the comments of indigenous participants aren’t obviously marked. There are a number of comments scattered throughout the discussions which implore people to either keep on topic of sharing information about the blockades or to be respectful of participants in the discussion. Likewise, some people request that posters show respect to indigenous people in general (Figure 4). Many different issues are raised by people who oppose the blockades. To be sure, it is not clear if these commenters are indigenous people or not although sometimes ancestry can be assumed (Figure 2). The issues include: the need for meat for sustenance by non-native hunters and their families, the illegality of the blockade, concern that resident hunters are as native as the natives, and a perception of unequal application of the law in favour of native hunters (Figure 3). Some are direct about their feelings citing the notion that indigenous people were conquered and therefore do not have special rights (Figure 2), that the government and/or the RCMP should be more involved in settling the dispute, and that indigenous people should stop receiving government monies in exchange for the moose. I don’t know yet where the analysis is leading. I have dozens more comments to code and categorize. Still, I value the openness of the discussion – as promoted by the possibility of anonymity? – for frank opinions. They give me concrete examples of the variety of opinions around indigenous rights and BC history for sharing with students or referring to in my writings. To be sure, identifying anything about the commenters is problematic. The advantage of perceived honestly as promoted by anonymous forums is tempered by my inability to say much about the backgrounds of the participants. Sure, many details are apparent in lengthy comments. Presumably, the HuntingBC.ca participants represent a community of hunters. But, identifying information is thin. Can anyone point me to writing about who comments anonymously on the internet and why? Are comments like these representative of the feelings of demonstrable communities like hunters? Or, is it best to assume that these comments represent fringe opinions? Any suggestions are welcome. This was written by Tad McIlwraith. Posted on Wednesday, May 12, 2010, at 6:19 am. Filed under Applied Anthropology, First Nations, Hunting, In the News, Methods, Parks, Resource Use. Bookmark the permalink. Follow comments here with the RSS feed. Both comments and trackbacks are currently closed. I am again getting burned at some peoples attitude towards First Nations, particularly BC’s. They never were beaten, they were never given the opportunity to make a deal (Treaty) before the colonials (and I am not First Nation but I live amoung the Tahltan and know where they’re coming from)occupied and imposed rules and regulations not related to reality and sustainablity that those First Nations had refined for many thousands of years.Immigrants to this country have more rights than those who occupied these lands in the first place so people stop the crying about Government money they receive. Corporations, their investors and you and me benefit from the resources that are being stolen without compensation right from under their feet. Those token dollars (beads and trinkets) are to appease them while we deplete the things they want to rely upon to sustain them and their offspring well into the future – they are determined to not be assimilated into the melting pot we whites think is the ultimate great thing. Why do we not want the same for other ethnic groups who imported themselves to this continent? Tahltan Territory is the only area that does not have limited entry hunting – why? because of the depletion of animal populations elsewhere. Is there anything wrong with not wanting the same thing to happen in Tahltan Country – for the benefit of all. on another note – whites (and other none First Nation that have a proven need to sustenance hunt due to financial constraints, are allowed and come up here and see the cost of your store bought beef etc. Freight charges are a killer and wages and welfare rates are the same as everywhere else – plus we have the climate to deal with (heating costs) out of the same budget. First Nations do not have the unlimited right to hunt in another Nation’s territory without permission from that First Nation. On yet another note – proven fact – First nation metabolism does not take well to white man’s diet only without a steady injection of local, from their land, sustenence. Thank you for your comment, Dave. You express the sentiments of some of the commenters in these news stories – but as you imply, you are in the minority. I think you nailed it with that line,i.e the comments say more…Indeed they illustrate just how little tolerance & respect there is for Indigenous Peoples in Canada. That fact gets reinforced over and over. No matter how well written an article is(or where it is published i.e CBC or National Post), that is in getting out the facts and background. One can not but be struck by the level of intolerance & ignorance expressed in the comments by the readers. Indeed I have been left dumbfounded and shocked at times,and I have been around the proverbial block more times than I can count. That said when I point out the comments to my friends(native) they are rarely surprised, having heard it all before.Indeed it’s a just a fact of life,it’s part of the reality that natives live on a daily basis, year in, year out. I appreciate your confirmation of that point , Dirk – regardless of news story or article, the views expressed in the forums attached to article are revealing. Figuring out what they reveal is at the heart of my project.